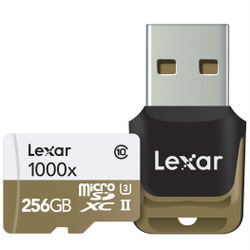 Lexar has announced a 256GB Professional 1000x microSDXC UHS-II memory card, which is designed primarily for GoPro action cams, sports cams, and tablets, as well as for aerial recording with a drone. Using USH-II technology, the card can write at up to 90MB/s which allows it to record extended lengths of video footage. And with transfer speeds of up to 150MB/s, it can accelerate workflow by quickly transferring files. The 256GB capacity makes it ideal for capturing 4K, 3D, and 1080p Full-HD video. It’s estimated to record and store up to nine hours of 4K video or 36 hours of HD footage. It has passed the ‘Works with GoPro’ verification process, a rigorous testing process to make it perform optimally with the action cam. The card is backwards compatible with UHS-II and UHS-I devices. It comes with a lifetime copy of Image Rescue software, and a USB 3.0 reader. It will be available in the first quarter of 2017 for an RRP of $450. Existing cards are available in 32Gb, 64GB, and 128GB. This entry was posted in New Products and tagged 256GB Professional 1000x microSDXC UHS-II memory card, gopro, Lexar by Keith Shipton. Bookmark the permalink.